Fook Yew opened its third outlet at Mal Kelapa Gading 5 following the success of the previous outlets at Gandaria City and Grand Indonesia. Adopting design of old-fashioned Chinese-pop street canteen for its interior and exterior while reinterpreting classic Shanghai comfort food concept for their dishes, Fook yew tries to bring colourful Shanghai street ambience to the busy life of Jakartans. Along with the new outlets, Fook Yew also launched its new menu on an event themed Fook Yew Tea O’ Clock (17/7). Here are the menus we tasted. Steamed dumplings with spinach, salted egg, and shrimp filling. Shen Jiang Bao is a signature menu of Fook Yew and hardly found at other Chinese restaurants. This is a kind of dumpling with skin made of pao dough base and cooked with pan-fried technique. It is a savory variant of Shen Jiang Bao with spinach and salted egg as the filling. It is a sweet variant of Shen Jiang Bao with house-made peanut butter consists of ground peanut, sugar, and butter. 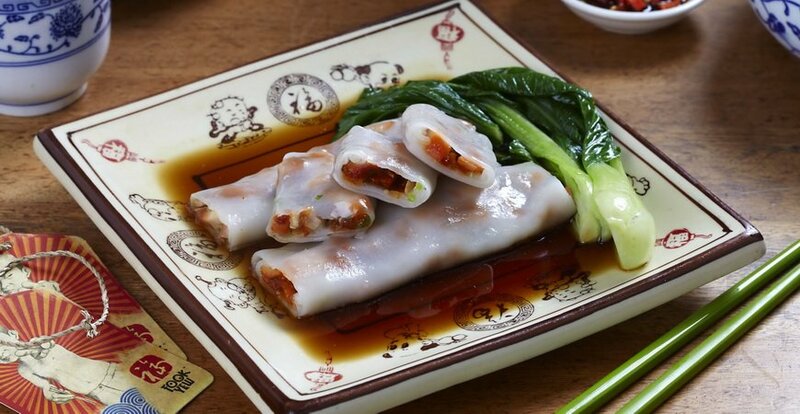 Crispy beancurd skin is filled with mixture made of minced mackerel fish, shrimps, and chicken. It is then wrapped in rice noodle layer. Crispy Go Hiong Cheong Fun is served with soy sauce and bokchoy. Crispy fried rice noodle is bathed in thick sauce consists of douchi (fermented black bean paste) and cubed meat. A whole roasted duck with crispy skin is served with two kinds of Master Hoong’s secret sauce; one has a fruity sweet taste and the other has tangy and slightly spicy taste. Thin rice noodle soup with soft and mild flavoured broth comes from the combination of Asiatic hard clam, milk, and ginger. Soft and light steamed cake with brown sugar taste. Fook Yew re-launched its Daily Mojo Program as well. Daily Mojo consists of Fook For Lunch package from 11 am to 3 pm every Monday to Friday (except public holiday), Dimsumania package from 3 pm to 6 pm every Monday to Friday (except public holiday), and Fookstagram which is a program aims to share people’s eating experience in Fook Yew through Instagram. To find out more about Daily Mojo, visit www.ismaya.com/fookyew or Fook Yew social media accounts at www.facebook.com/f00kyew, www.twitter.com/FOOK_YEW, and www.instagram.com/fook_yew.